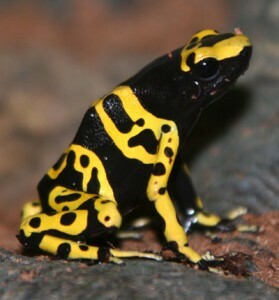 Bumble bee dart frogs are one of more than 100 dart frog species and live in the tropical rain forests of Venezuela. Indigenous peoples of South America have used its deadly poison to tip their arrows and blowgun darts, hence the species’ name. They are extremely toxic; in fact they produce one of the most toxic natural substances in the world. Some dart frog species are so deadly that a single tiny frog can kill up to ten full grown men!